Institutional open access policies often get a bad rap. Critics point to their lack of “teeth”; their poor compliance rates; their failure, thus far, to effect substantial change within the economically unsustainable and locked down scholarly publishing environment. 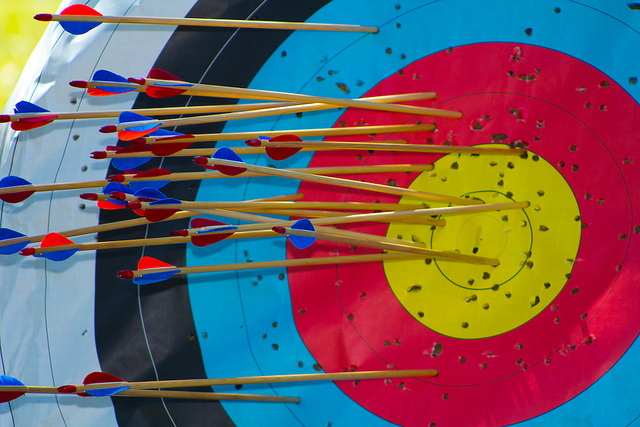 Motivated by the desire to free all scholarship from publisher access restrictions and the equally ambitious goal of empowering all authors to retain rights to their scholarly publications, these policies struggle mightily under the weight of expectations. But maybe we are expecting too much — or not enough. While 100% policy compliance sounds admirable — and is always the implicit point of comparison for any lesser compliance rate (always in percentages!) — it is a narrow and arbitrary definition of success that relies entirely and exclusively on the metrics of policy participation to gauge effect. Let’s take a moment to consider some other measures of success, particularly in the setting of the University of California’s open access policy. 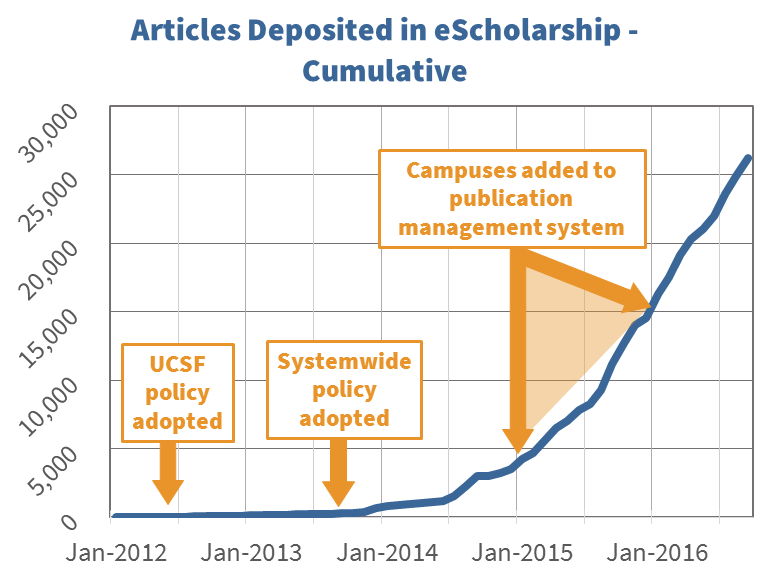 So far, there have been over 27,000 scholarly articles deposited in eScholarship (UC’s open access repository and publishing platform) since the adoption of UCSF’s Academic Senate Open Access Policy in May 2012, followed by the UC systemwide policy (all 10 campuses) one year later. And these articles have since been accessed and read globally — indeed in all corners of the world: international cities, remote outposts and all points in between. The work of collecting these articles has grown gradually, from a low-key phase of manual deposit (faculty filling in web forms), to a promising three-campus-piloted mechanism for automatically harvesting publication records and prompting faculty to deposit their manuscripts, to a full-blown expansion of this publication management system to all Senate faculty on the ten UC campuses, as of January 2016. We have only just begun to collect publications at full throttle, but already we see a significant uptick in policy participation thanks to this automated system. The growth of this corpus of open publications reflects the expanding infrastructure to support this policy and the increasing awareness among faculty that the policy protects their interests as authors and researchers who seek to extend the reach of their work. The most popular articles deposited in eScholarship during the pilot phase of this implementation effort have already enjoyed the attention of hundreds — even thousands — of readers. In other words, there have been many points of access to material that remains otherwise gated behind publisher paywalls. We should expect THIS. — Valerie S Jakar, Shanan Academic Teachers’ College, Haifa, Israel. It turns out that we don’t have to leave the United States, however, to encounter the same stories of limited budgets, limited access, and a keen desire to be informed. Many of our “local” anecdotes paint a picture of a country struggling to provide adequate access to research for those who reside within cash-strapped universities — or outside academia altogether. Every one of the over 27,000 articles we have collected thus far under the auspices of UC’s open access policy represents an opportunity to spread knowledge beyond the artificially restrictive publishing marketplace that has both stressed academic library budgets and created a global population of have-nots who — by virtue of their place of employment, the financial limitations of their country/institution, or their own limited funds — struggle to gain access to fundamental (and often publicly funded) research. Clearly open access policies alone cannot solve this problem, but they can, and they often do, prompt frank conversations about fundamental issues like access and knowledge and funding and obligation among readers, researchers, librarians and publishers. We should expect THIS. And don’t forget — authors now have rights! Finally, in our preoccupation with low compliance rates for open access policies, we often forget to highlight the transformative rights declarations of these policies, which are purely independent of compliance and apply to all authors. Regardless of whether or not they deposit their articles in their local repository, authors at institutions with opt-out, rights-retention policies are no longer beholden to publishing agreements that vary from publisher to publisher, are hard to keep track of, and may leave authors with few — or no — rights in their own work. This is a big deal. UC’s Academic Senate Open Access Policy declares that “each faculty member” grants the University “a nonexclusive, irrevocable, worldwide license to exercise any and all rights under copyright relating to each of his or her scholarly articles, in any medium, and to authorize others to do the same.” By automatically granting a broad set of rights to the University, who then holds on to those rights for authors to use later, the policy constructs a worldview in which authors need not (and should not) completely relinquish their stake in their intellectual labor in order to publish — and in which publishers can no longer exclusively control the destiny of a publication. The only exception is among authors who opt out of the policy in order to work with a publisher who requires a policy waiver. But those are rare — and growing rarer. We should expect THIS. We err when we burden open access policies with sole responsibility for curing the ills of the scholarly publishing marketplace. And we err again when we judge the effectiveness of these policies solely by the rate with which the faculty deposit their articles in institutional open access repositories. If our goal is to increase access to scholarly research — and well it should be, given the stories we hear — we need to recognize that there are many paths to that end. Open access policies with robust article deposit rates get a lot of research out there to be read — and the more research we can open up, the better. That’s why we are working so hard to grow the corpus of open publications at UC. But all open access policies, regardless of their compliance rates, create an opportunity to collect stories that give a voice to those communities of readers who don’t yet have access. And these stories, in turn, help naturalize the idea of openness by increasing awareness among authors who may not realize the missed opportunities they have (and the rights they possess) to reach new communities of readers. Naturalizing the open scholarly communications environment is a gradual process, but this work has helped ease the way for other important interventions in this space, like SCOAP3 or the Open Library of the Humanities or federal funder mandates or OA2020. It has been eight years since the Harvard faculty adopted the first institutional open access policy in the United States, and many other policies have followed. Almost a decade into this institutional policy work, open access has become an expectation rather than an experiment. We should celebrate THIS.